Larry Lenora is the founder and owner of the law firm Lenora & Upton. Larry began practicing law in Chandler in 1976. After graduating from OU Law School, he decided he wanted to locate in a small city near Oklahoma City or Tulsa. As he tells the story, he and his wife got on the Turner Turnpike in Oklahoma City and headed east. Chandler was the first exit they came to and he’s been here ever since. After a brief stint working with John Taber, Larry joined partners Dan Erwin and Ben Butts as an associate. Several years later, the firm of Erwin, Butts and Lenora was formed. In 1992, Ben and Larry started the firm of Butts and Lenora. After Ben’s death in 1997, Larry was a solo practitioner until hiring Gregory Upton as an associate in January 1998. The firm of Lenora & Upton was established in January 2006. In the summer of 2007, Sarah Soderstrom-Bridge was added as the third attorney in the firm. A former high school and collegiate debater, Lenora specializes in litigation. His primary area of emphasis is criminal defense. However, his practice includes a variety of litigation matters including civil cases of all types and family law cases involving substantial assets. Lenora has been the city attorney for Chandler since 1980. In 2014 he was named by the Stroud City Council as the city’s new municipal judge. He has also served on the Supreme Court of the Sac and Fox Nation since 1999, including six years as its Chief Justice. Lenora is a member of the American Association of Premier DUI Attorneys, the National College for DUI Defense and was named one of OKC metro’s top criminal defense attorneys. This year, Lenora was one of only 100 lawyers in Oklahoma to be recognized with a Lifetime Achievement award by America’s Top 100 Attorneys. Greg Upton focuses his practice in the areas of real estate, banking, estate planning, and probate. Greg has built a large and loyal clientele since arriving in Chandler in 1998 as a complete stranger. “Greg has done a phenomenal job,” Lenora said. “He’s earned a large share of his business through hard work, dedication, and client service. We have always followed a motto of Ben’s: ‘Do the work and the money will take care of itself.’ Greg has completely bought into that belief.” Greg was appointed assistant City Attorney six years ago and in 2014 was named to the board of directors of the First Bank of Chandler. Sarah Soderstom-Bridge filled a gap that was created by Lenora’s desire to “get out of the kid business.” After thirty years of a thriving divorce practice, Larry decided to let someone younger fight the battles over children. A graduate of Chandler High School, Sarah always wanted to return to her hometown to practice. When the opportunity presented itself right out of law school, it seemed to be destiny. “Sarah’s done a great job. I marvel at how she’s able to handle the extreme stress that comes with that work,” Lenora said. “My only regret is that because she’s done such a good job, I don’t get to have her help in my areas of practice since she’s so busy in hers.” Sarah also represents abused and neglected children as a contracting lawyer with the juvenile system in Lincoln County. Lenora & Upton is the only law firm based in Lincoln County that is rated AV Preeminent© by Martindale-Hubbell. 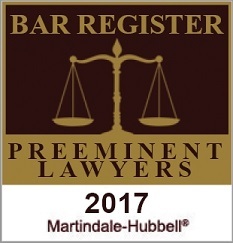 For 130 years, Martindale-Hubbell has provided a peer-review system to rate attorneys. All ratings are done by attorneys and judges confidentially. The AV Preeminent rating is the highest possible rating in both legal ability and ethical standards. Lenora & Upton, as well as its predecessor firm of Butts & Lenora, has been listed in the Bar Register of Preeminent Lawyers since 1995. The office of Lenora & Upton practices law in Chandler, Oklahoma and Lincoln Co.. Please contact our Chandler law firm with questions about your legal issue. Provide as much information as possible regarding your inquiry. While this contact does not serve to establish an attorney/client relationship, it will allow our legal team to begin an assessment of your case.